Last week, I offered my schedule for CONduit (which is this weekend, come see me!) as well as a self-imposed deadline to finish the latest rewrite of The Aeronaut, which is–hopefully–my next book to see release. Well, I'm happy to report that I finished it that night. I powered through the last few thousand words that needed to be written and revised everything that else that needed changing. I drastically re-wrote the ending, which was incredibly difficult for me to do. The ending that was written originally was a series of scenes that I had been dreaming of years before I ever even began to write the book. In fact, I wrote the first pieces of the book as I'd originally imagined it back in 2008 after percolating the story for a while even then. It's something that's been very close to me. It's a personal story and it's important to me that I get it right. But the ending wasn't working. My original idea wasn't what the story morphed into. It's not what the book needed. And that's what is most important. When you're editing, it's vital to do what's best for the piece, not serve the prior visions of the story you might have had. "Kill your babies," is sound advice I've received numerous times from a variety of mentors and it's served me well. Kill them without hesitation. It will hurt, but if it's for the good of the piece, what else are you going to do? I've been so lucky with my covers and their designs and this one takes the cake. I love how it's the colors of the French uniform... And Preston there on the front... I'm just really excited for you all to finally read the book. I'll be a guest on the Stuff You Missed in History Podcast at their first live show in New York in October as part of New York Comic-Con's "Super Week." We're going to have an incredibly fun conversation about presidential assassination and you won't want to miss it. You can buy tickets to the event here. Much sooner than that, I'll be a guest at Origins Game Fair in Columbus, Ohio from June 3-7 and I'll be doing lots of great panels about writing. I'll be publishing my schedule next week, be sure to come if you're in the area. It's going to be super informative. And Mike Stackpole and Timothy Zahn will be there, too. Origins is also publishing their annual anthology, and my story, "Double Cross in Deep Space," will be for sale there. You can get tickets to Origins here. Sooner than that will be two other events. This Thursday, I'll be doing the "Write Out Loud" event at the downtown library in Salt Lake City. I'll be reading a science fiction story. You can get more information about that event here. And next week, we'll be doing a signing at Eborn Books on Main Street in Salt Lake City next Friday for Apollo's Daughters. I'll have more information about that next week. On the writing front, I started a new short story for my science fiction/space opera collection, as well as a new fantasy novel. 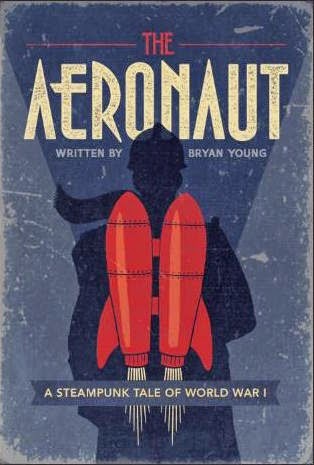 I'm excited to tell you more but, to be honest, I've written four other books between The Aeronaut and this book that I can guarantee it'll be years before you hear more about this book except for updates here. As for other writing: I interviewed Geoff Johns and Gary Frank for Huffington Post. We talked mainly about Batman: Earth One Volume Two, but there was a really fascinating exchange about designing the world in character. Batman's costume, for example, is designed quite specifically by the artist through the eyes of this particular Bruce Wayne and we spoke about how to get in the head of a character and create things from their perspective. It made me think a lot about getting deeper into the heads of my characters rather than the whims of myself as a writer. In any case, you can read that interview here. As far as my work outside of these things: I remain busy for Big Shiny Robot! and Full of Sith.